On October 2, 2015, we had a question-and-answer call with Dr. Bernie Roth, Rodney H. Adams Professor of Engineering at Stanford and co-founder of Stanford’s d.school–the Hasso Plattner Institute of Design, and author of the new book The Achievement Habit: Stop Wishing, Start Doing and Take Command of Your Life. You’ll also receive a complimentary subscription to the eMC News, our monthly enewsletter, and can opt out at any time. Your privacy and email address are safe with us. How could coaches benefit from a mechanical engineer’s book on achievement habits? And then, take into account that the mechanical engineer, professor, and author is Dr. Bernard Roth, co-founder of an internationally-recognized center for innovation, the Hasso Plattner Institute of Design at Stanford University (the d.school). Back in the 1960s, Bernie met many engineers in the Silicon Valley, who worked for big companies such as Hewlett-Packard, and who had dreams of starting their own companies. But he noticed that they just talked about their dreams. Nothing happened. This observation inspired Bernie to develop a class in which he asked students to select a project having to do with their own lives—writing a cookbook, building a robot, running a marathon. The only requirement was that the project had to be deeply personal. His mantra was “Doing is Everything,” and he helped students move into action by refining their questions and teaching them what is now known as design thinking, a set of analytical skills and concepts that are usually applied to objects, to problems in service design, or organizational processes in business, government, education and non-profits. Bernie went beyond this to apply what is now known as design thinking to students’ personal lives, to address the limited self-images that were holding them back from achieving their potential and goals. Bernie has been teaching his popular “Designer in Society” class at Stanford since 1969—more than 45 years. The d.school uses a collaborative team teaching approach, and students are empowered by being immersed in hands-on situations–field studies where high-level insight and out-side-the-box strategies help them come to creative solutions. In the process, everyone involved expands their awareness and undergoes personal change. 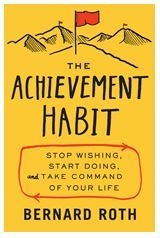 Bernie’s new book, The Achievement Habit: Stop Wishing, Start Doing, and Take Command of Your Life, outlines the concepts he has been teaching and reflects his belief that achievement can be learned and strengthened. Once these skills are used habitually, they can be applied to all kinds of goals and challenges. He presents discussions, both personal and student stories, and exercises to help us create a different life experience, applying insights that stem from design thinking to address problems and obstacles, ultimately allowing us to redesign our own lives to be more satisfying and productive. His comprehensive approach has much to offer any of us who are working with people engaged in a process of discovery. As coaches, we’re familiar with strategies like reframing, breaking tasks into manageable pieces, brainstorming, and shifting perspectives to expand awareness. Bernie promotes these, and adds applications from design thinking to our tool boxes, including coach-relevant topics such as language and communication recommendations, exercises for building groups and enhancing relationships, diagramming and mindmapping, and methods for arriving at the essence of a presenting problem—often very different than whatever problem or obstacle was initially identified. Bernard “Bernie” Roth was born and grew up in New York City, graduating from the City College of New York. He received his M.S. and Ph.D. in Mechanical Engineering from Columbia University, in 1958 and 1962, respectively. Bernie now serves as the Rodney H. Adams Professor of Engineering at Stanford University. A 52-year veteran of the Stanford design scene, he first became a member of the Stanford Design Division faculty in 1962. He arrived from New York with a wife, two children, a proper haircut, a sports jacket and his very traditional background in Mechanical Engineering and liberal New York politics. The experience of the Vietnam War protest movement, the Human Potential Movement, and the other social upheavals centered in San Francisco Bay area transformed his life as an educator. It added a missing dimension: the explicit concern for his students’ education and growth beyond simply developing their technical expertise. The only things Bernie seems to have lost in the transition are the clean haircut and sports jacket. His most recent activities have moved him more strongly into experiences that enhance peoples’ creative potential through the educational process. His primary intention as an educator and person is to empower his students, colleagues and friends to have fulfilling lives. Bernie brought to the d.school a wealth of experience in teaching design, an intimate knowledge of the functioning of Stanford University, and a worldwide reputation as a researcher in kinematics and robotics. Since 2005, the d.school has been the primary focus of Bernie’s professional activities. He serves as its Academic Director. In the 1980’s, Bernie, (together with the late Rolf Faste and Doug Wilde) developed the concept of a Creativity Workshop. The Workshop was offered to students, faculty and professionals around the world. These same techniques have been made available to d.school students and are described in The Achievement Habit. He has found that these types of learning experiences enhance students’ ability to make meaningful positive difference in their own lives. He is especially pleased that his activities at the d.school have contributed to creating an environment where students and coworkers get the tools and values for realizing the enduring satisfactions that come from assisting others in the human community. Bernie has become well known for organizing and presenting workshops on creativity, group interactions, personal effectiveness, and the problem solving process. Formerly Bernie researched the kinematics, dynamics, control, and design of computer controlled mechanical devices. In kinematics, he studied the mathematical theory of rigid body motions and its application to the design of machines. He has published widely in the areas of design, kinematics, robotics, creativity and education, and has earned numerous awards: seven Best Paper Awards (ASME), the Melville Medal, the Mechatronics (MESA) Achievement Award, the outstanding Design Educator Award (ASME), J. F. Engleberger Award (IFR), the Pioneer in Robotics Award (IEEE), the Robotics and Automation Award (IEEE) and honorary PhDs from the University of Paris and the University of Casino. In 2012, Columbia University’s Engineering School Alumni Association awarded him with the prestigious Egleston Medal for Distinguished Engineering Achievement. Bernie has also served as an industrial and government consultant and a director of several corporations, and president of the International Federation for the Promotion of Mechanism and Machine Science (IFToMM) as well as chair of ASME’s Design Engineering Division. Bernie and his wife Ruth live on the Stanford campus in Palo Alto, CA. He is fortunate to be able to bike to work and to many other daily activities. For over thirty years he has been part of a group that rides a twenty-mile bike loop each Sunday morning. He has two grown sons who also live in the Bay area, Elliot in San Francisco, and Steven in Novato. Experiential Design Courses in Engineering Education. The Design of Projects and Contests-the Rules of the Game.